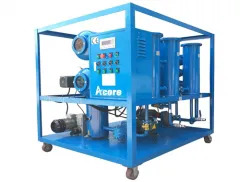 ACORE developed TCF Online Load Tap Changers Oil Filtration System (Oil Purifier) to remove carbon, moisture and metal particles in tap changers, this system can help users reduce the operation and maintenance cost of load tap changers, improve the system reliability. TCF Load Tap Changer Oil Filter Unit can completely solve the problem of insulating oil easily decomposed, aging, pollution of free carbon and metal debris, breakdown voltage reducing and dielectric properties deteriorating. With high quality components and comprehensive design, TCF is ideal system for on-line oil filtration. 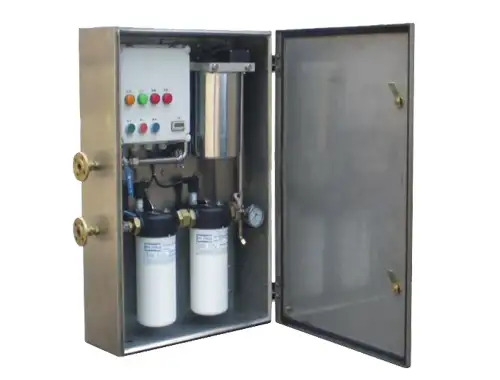 VLF Lube Oil Purifier is a multi-functional oil filtration flushing machine for all kinds of lubricating oils, it can quickly remove the impurity, moisture, gas and acid to improve the quality of oil and restore the characteristics. VLF Lubricating Oil Purifier is a ideal filtration system for maintaining original property, ensuring optimal performance and extending service life of lube oils. It also help end-user reduce overall operational and maintenance cost. 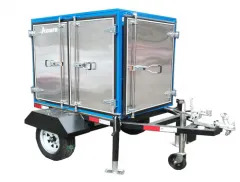 ACORE designed MTP Vacuum Transformer Oil Purification Treatment Machine Mounted on Mobile Trailer as online processing plant with vacuum dehydration, degassing, drying and removal of contaminants to maintain the absolutely cleanness of dielectric oil filled in transformers. 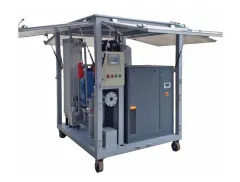 DVTP Double Stages High Vacuum Transformer Oil Purification Machine (Oil Purifier) adopts double stages dehydration, degassing chambers and three stages filtration systems, which can quickly improve dielectric strength, reduce water, gas and particle content and other contaminants. 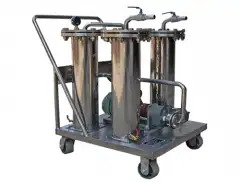 TOP Turbine Oil Purification Plant (Oil Purifier Machine) adopts precision filtration, vacuum drying, coalescence separation dehydration technology, this filtration system can remove free water, emulsified water and impurities to restores oil cleanliness and can make aging and emulsified turbine oil become cleaning. 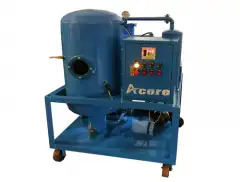 Acore produce PT portable oil filtration machine (oil filter carts) for versatile, reliable, high precision filtering processing of a wide range of industrial liquids. 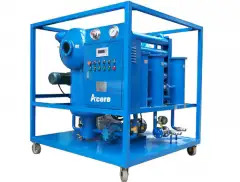 It can meet critical industrial lwaste oil filtration requirements and oil transfering. 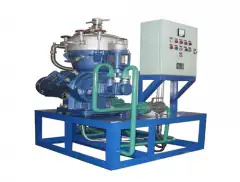 VDF Vacuum Dehydration Oil Purification System (Oil Purifier Machine) use high vacuum dehydrator plant with precise filtration system for the removal of particles, free and emulsified water, sludge and other contaminants. 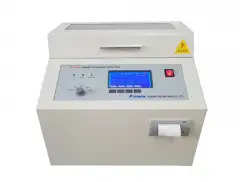 DST transformer oil tester is designed for measurement of insulating oil dielectric breakdown voltage strength according to international standard IEC156 and ASTM. 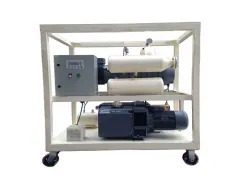 VPS Vacuum pump machine is consisted of vane vacuum pump and roots vacuum pump, the vacuum pump set is mainly used for vacuum transformer drying. VPS vacuum pump system can bring electric equipment to vacuum state quickly. 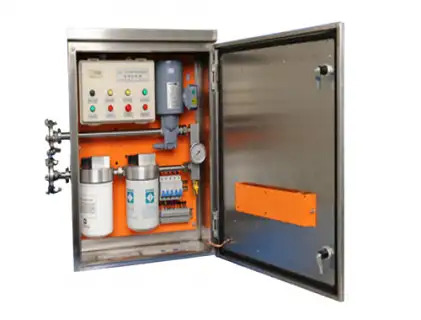 DHP Dry Air Generator (air drying and purification system) is specially designed for drying air and filling dry air to transformers for safe operation and maintenance of electric equipment. DCS Disc-type Centrifugal Oil Separator is the internal designing of a self-cleaning centrifuging type oil purifier, which is mainly used for cleaning of waste marine diesel fuel oil, turbine oil, lube oil etc. TCF Online Load Tap Changer Oil Purifier removes carbon, moisture and metal particles in tap changers,it can help users reduce the operation and maintenance cost of load tap changers. TCF load tap changers oil filter unit uses stainless steel materials, NEMA 4 enclosure, self-priming positive displacement pump and high precise filter elements. 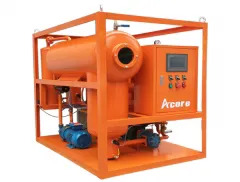 High Vacuum Transformer Oil Filtration Treatment Machine supplied by ACORE is widely used for online and off-line purification of insulating oils, this oil filter machine uses special design for maximizing dehydration, degassing and filtration rate, top-quality components and workmanship, most effective and durable.